A reliable source for Heavy Duty Workbenches information and a resource for accessing leading Heavy Duty Workbenches and suppliers. Heavy duty workbenches can also be a great stand for packaging tools and other small machines that are used on a daily basis. These work stations are constructed to be durable and bear the weight of very heavy objects so that they don’t bend or break under the demanding conditions of a working environment. Heavy Duty Workbenches A heavy duty work bench can be very convenient in an industrial or commercial setting where you need to work on things at waist level and you need enough space to lay out tools or equipment. The frame is built using strong metal like steel, and the surface of the work bench is usually made of a thick piece of wood, although some benches have a flat steel surface instead. 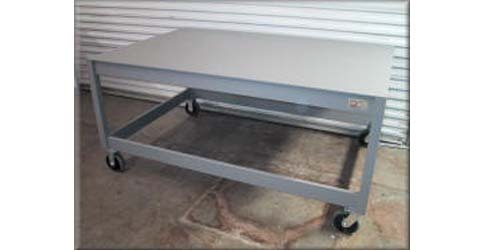 The steel frame of a heavy duty work bench is usually painted and coated with a sealant that protects it from corrosion when exposed to the elements, making the workbench more durable and preventing the metal from weakening with time. 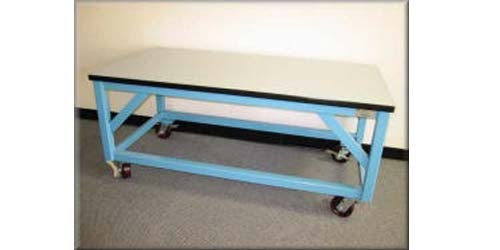 Heavy Duty Workbench – RDM Industrial Products Inc.
A heavy duty workbench is capable of handling thousands of pounds on its sturdy frame. These types of workbenches are found in machine shops, auto repair facilities, woodworking stores, welding and metal fabrication plants and more. Many industries integrate workbenches into the layout of their factories to be used during the detailing or finishing process when they are manufacturing a product. A heavy duty workbench is a great feature in commercial settings where a multi-purpose space is needed for everything from hands on work with power tools to drawing blueprints and sitting down to fill out paperwork.